Ever wonder what those small 'orange moths' are that you see in the lawn and garden? They are a type of butterfly called a skipper, and one of the most common is the one shown below, the Fiery Skipper. Skippers don't look like what most people think of as butterflies, but they can be fascinating and fun to photograph none-the-less. The fiery skipper is very territorial and fast moving, feeding on the nectar of various flowers. 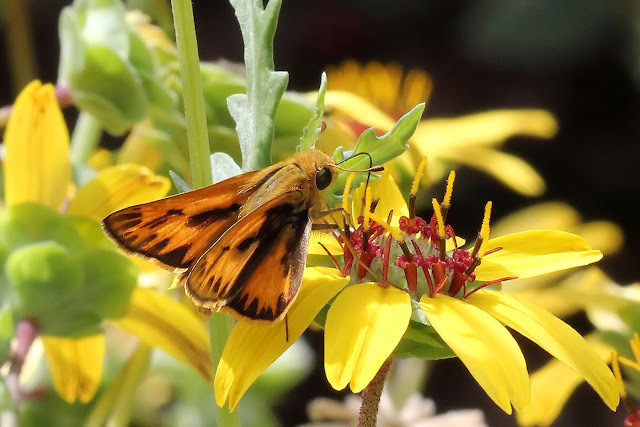 One key aspect of its habitat (like many skippers) is grass, which is why they are at home in many suburban yards. They are, however, partial to bermuda grass. And whether this is cause or effect, they are unlikely to stray into the colder climates of the USA. The photo above was on our 'Chocolate Flowers', which do indeed smell like chocolate. These are an excellent native flower of the western USA - highly recommended.